Today's hardwood flooring can be specified for just about any interior space. Acrylic impregnated wood flooring performs the best for kitchens, powder-room or other places where splashing water occurs. The only interior spaces where hardwood flooring is not recommended are steam rooms, rooms containing bath tubs or showers, and other rooms that are subjected to excessive steam or out-and-out drenching. Acrylic impregnated wood flooring uses a prefinished treatment applied by the manufactured. 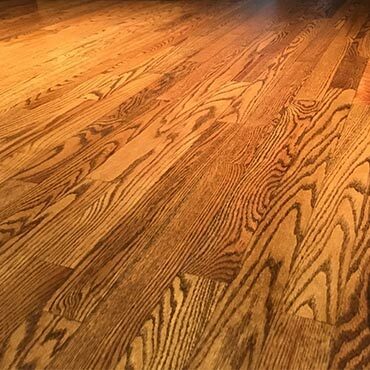 Moisture is vacuumed out of the wood and through a high-pressure technique; liquid acrylic, colored stain and optional fire retardants are injected into the open pores throughout the depth of the hardwood. Afterwards, the wood goes through a solidifying process creating an exceptionally hard surface that is significantly harder than non-impregnated wood. The acrylic resin makes it up to 300% harder and more indent resistant than natural wood. Because liquid acrylic and stain is essentially injected into the wood, the color goes all the way through. This type of hardwood floor is extremely resistant to moisture and abrasion and appeals most often to commercial clients but is also used by residential consumers. To recognize an acrylic impregnated wood flooring, look at the side of the wood. If the color is consistent throughout the plank, it is probably acrylic impregnated. However, some wood species will have consistent color throughout the board and is not impregnated wood flooring. If in doubt, contact a wood flooring professional. Since color cannot deteriorate through abrasion or wear, scrapes and scratches are hardly perceptible. For the same reason though, the floor can never be re-stained. Ultraviolet-curing and acrylic-impregnation are strictly factory processes. During the manufacturing process, areas with few pores may not absorb color very well; lighter shades provide the most even and natural appearance. Acrylic-impregnated floors are recommended for kitchens and high-traffic public areas such as airport terminals, malls, restaurants, and elevator floors. As you walk on hardwood floors over a period of years, you actually wear the hardwood. With the acrylic-impregnated product, you retain the color as it wears. Since the acrylic-impregnated wood flooring has color or stain and liquid acrylic impregnated throughout the wear layer manufacturers can usually warrant color retention for up to 25 years. Acrylic impregnated flooring is available in solid parquet and laminated strip and plank. Strip flooring is linear flooring that is usually 2-1/4", 1-1/2" or 3-1/4" wide. It creates a linear effect in a room, often promoting the illusion of a larger space. Plank flooring is also linear, however it is wider in width. Common widths of plank flooring are 2 1/4" and 3 1/4", other sizes are available. Plank flooring is often preferred for a more traditional or country decor. Parquet flooring is a series of wood flooring pieces that create a geometric design. Parquet offers a variety of design options, when linear is not your preference. Because the wear surface is so tough, you're not going to have the usual maintenance issues. How you clean an acrylic impregnated floor will depend on the finish. Some acrylic impregnated floors are top coated with an ultraviolet urethane, while others do not have a top coat. Use the cleaning system as recommended by the manufacturer.